For more than 50 years, San Jose State was one of the iconic names in track and field. Fueled by legendary coach Lloyd “Bud” Winter who led the Spartans from 1941 through 1970, the school produced champions, outstanding coaches and fine sportsmen at every level. There were individual and team conference titles, national champions and international and Olympic medal winners with roots grounded in the West Coast school that focused originally on training teachers in all disciplines for future generations. Before Winter came on the scene, San Jose State began making its name in the sport in the 1930’s. Jack Wool, the winner of the 1931 AAU pole vault, was the school’s first national champion in any sport. In 1937, javelin thrower Lowell Todd was the first Spartan to win an individual NCAA title. Today, San Jose State can claim 27 AAU and 27 NCAA individual and relay event champions. Willie Steele was the first San Jose State athlete to win an Olympic gold medal when he finished first in the 1948 London Olympics broad jump. 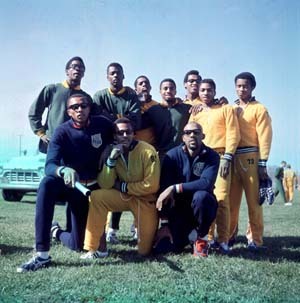 Sprinters Tommie Smith, Ronnie Ray Smith and Lee Evans would claim their gold medals at the 1968 Mexico City Olympics. San Jose State’s four Olympic gold medals in 1968 would have tied for 12th best at the Games and been more than countries such as Italy, Kenya, Mexico, Yugoslavia, Bulgaria and Sweden. Stunningly, San Jose State athletes won more track and field gold medals than the Soviet Union, East Germany and West Germany. Click here for the full PDF document.